If you don't eat a lot of cold water fish‚ flax seed‚ or walnuts‚ there is a good chance that you aren't getting enough omega-3 fatty acids. These fatty acids are essential to your health‚ but your body can’t produce them; instead you have to get them through your diet. The benefits that they provide are simply too good to miss out on. Some of these benefits include improving emotional wellbeing and mood‚ boosting cognitive function‚ promoting cardiovascular health‚ supporting gastrointestinal health‚ and keeping your skin healthy and younger looking. 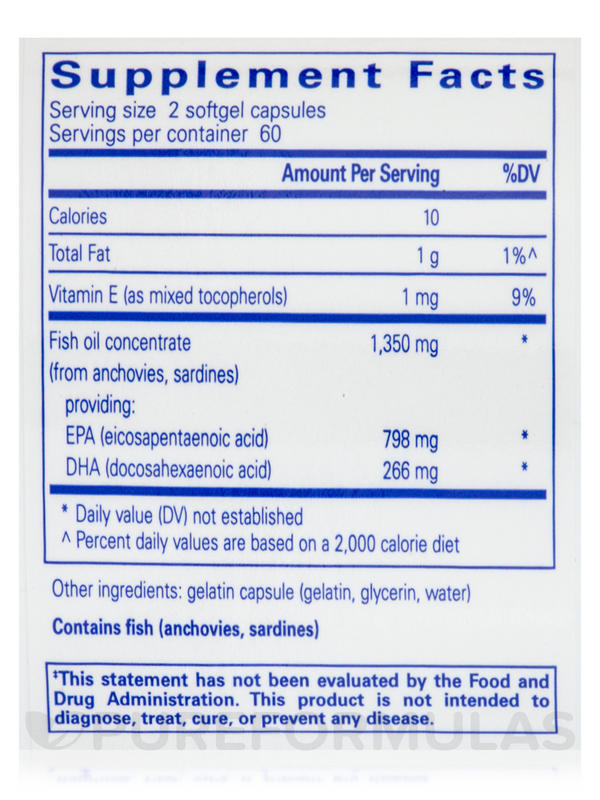 If you aren't already getting enough omega-3 fatty acids‚ you should try to eat more of the foods that contain them. If you don't or can’t eat oily fish‚ flax seed‚ or walnuts on a regular basis‚ you might want to try a convenient supplement. 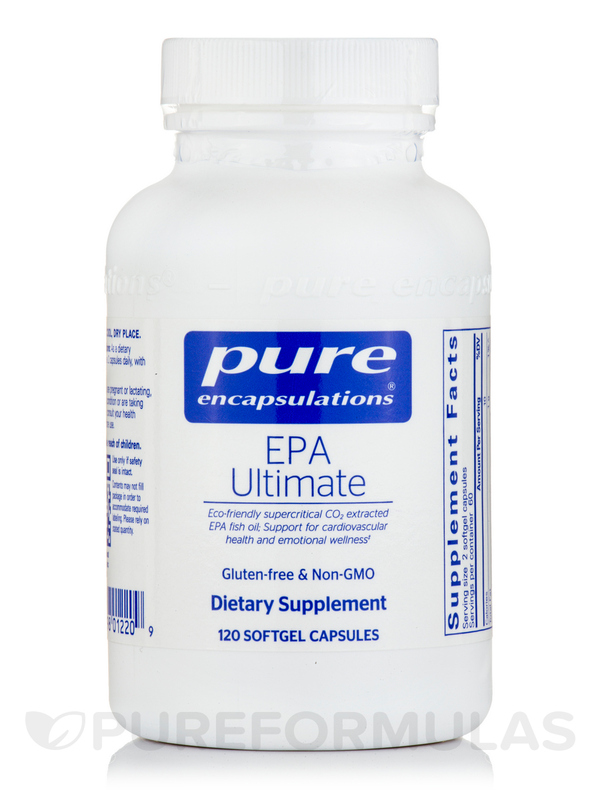 Pure Encapsulations’ EPA Ultimate contains a fish oil concentrate that is high in both EPA and DHA‚ both of which are important components of omega-3 fatty acids that support brain health. 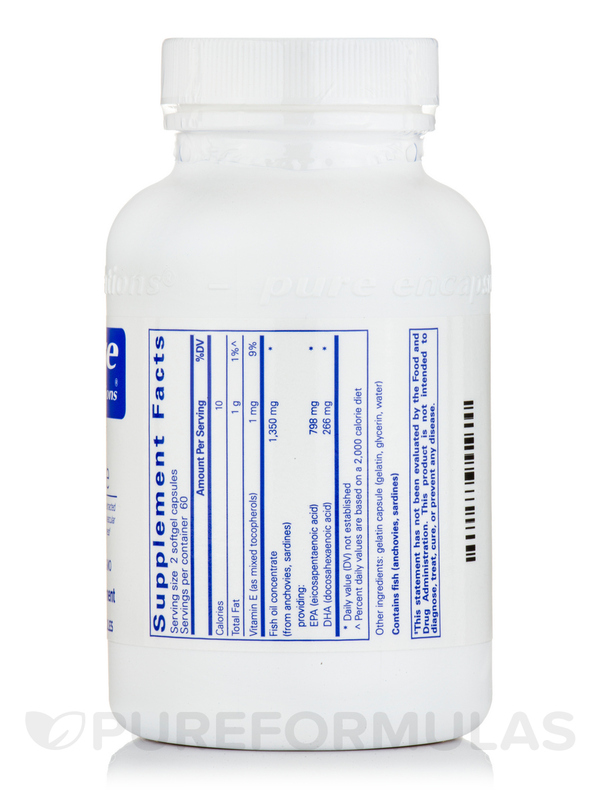 This supplement may help improve your emotional state as well as your physical health. 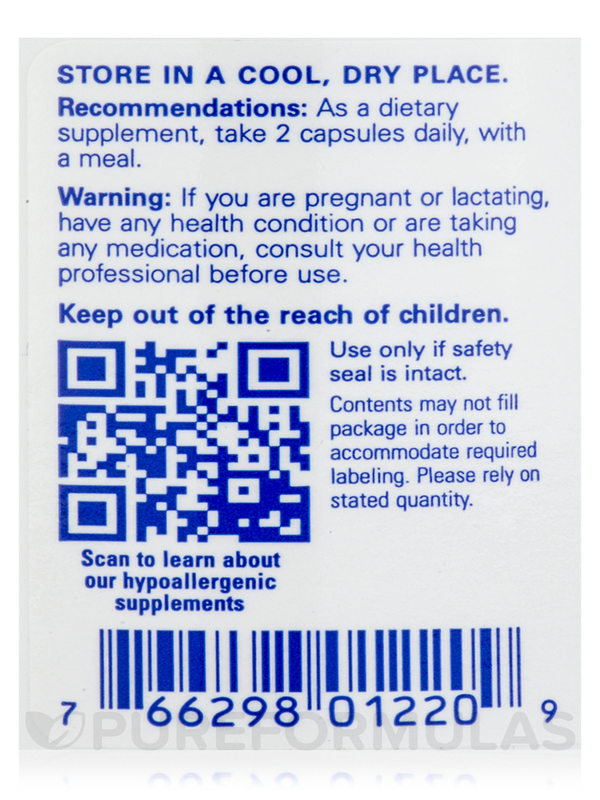 In addition‚ each softgel capsule also provides vitamin E‚ which promotes absorption of the omega-3s while promoting cardiovascular health. 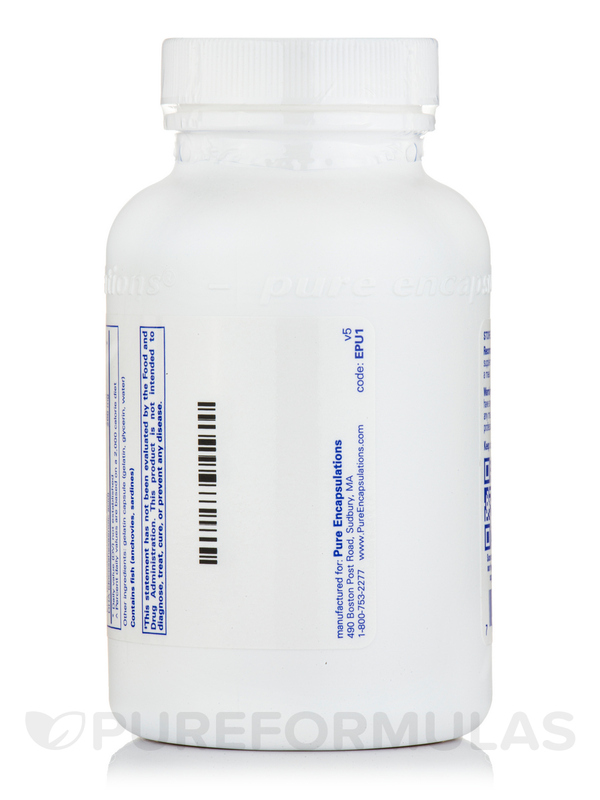 This bottle of EPA Ultimate by Pure Encapsulations contains 120 softgels‚ which should last for about two months if you take the recommended dosage of two softgel capsules per day. **Percent Daily Values based on a 2‚000 calorie diet. Your values may be higher or lower depending on your calorie needs. 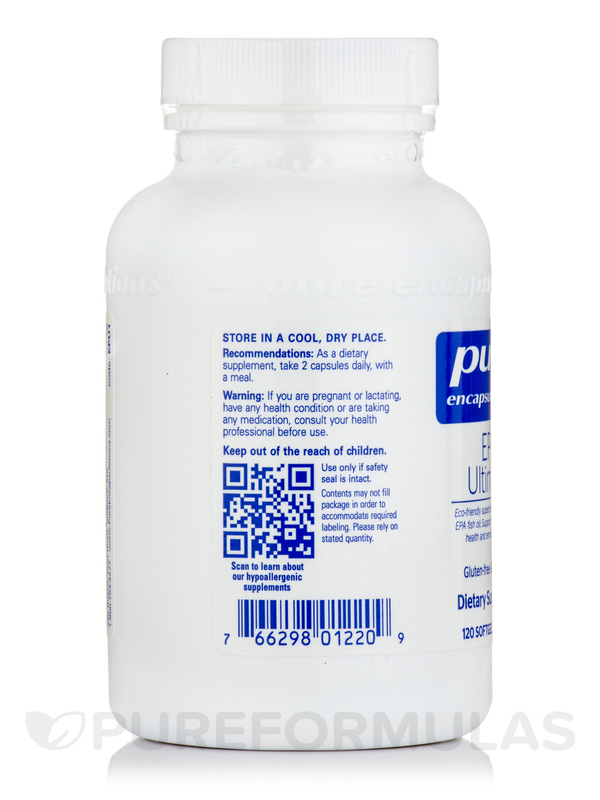 Other Ingredients: Gelatin capsule (gelatin‚ glycerin‚ water).